Unique sculpted handles and bas relief images make these coffee mugs truly special collectibles and express your unique personality while you drink your favorite beverage. 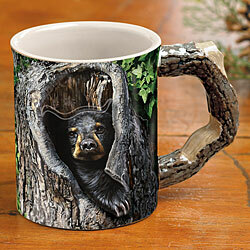 They also make great gifts for the coffee loving outdoorsman or woman on your list. Images on mugs are raised for 3-D effect. 16-oz., 4-1/2" high. Microwave and dishwasher safe. Gift boxed.